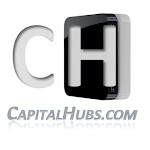 Forecasting capital markets is usually considered to be a simple guess of the movement. In this regard there may be some justification since the course of the market depends on future events with an unknown outcome. However, based on observations and appropriate tools we might be able to predict certain movement. Once a clear trend with direction in the primary market is defined we can assume a certain pattern will appear based on selected accurate metrics. The last helps us as a guide for determining repeating forms. Here the ratio between every two consecutive numbers is close to 1.618 as well. This is no accident. It is mathematically proven that the formations based on this relation are most effective and this effectiveness could be applied to the financial markets. Regarding to the efficiency of capital markets the issue is to be discussed further. As noted above the golden section is widely spread in the nature, but it can be seen and the financial assets price moves, although not as accurate as in nature as here humans are involved and sometimes human rationality is questionable. Fibonacci numbers can be used to determine the levels of adjustment to changing trends (retracements) and projecting new levels, thus forecasting future movements. Again, accuracy is relative and main task is determining the major direction limited by target range. This is the end point of the forecasting process. Forecasting technique using Fibonacci numbers is very simple process. The most important thing is to determine the beginning of the uptrend and its peak. Once these two points are set we can safely find the end point of the next up cycle by multiplying corrective move length with 1.618. The bottom in March 2009 and the subsequent rise in Dow Jones is used in the method described further. In this case forecasting via the technique completely accurate sets next target before following significant correction. Back to efficiency of the method markets often appear ineffective and in this case that technique could be used as it is based on mass psychology of the crowds. For complete certainty one should consider and keep in mind the current state of the economic cycle. Moreover, markets could stay inefficient for quite long time mainly driven by fear rather than corporate or economic fundamentals. In this case no valuation model is working as investor mood does not distinguish between quality and non quality assets. With using methods for forecasting humans try to rationalize irrational and unexplained behaviour with repeated patterns as sign of gained experience. As long as human brain way of functioning is trough skills gained with past experience this sound logical. Employing Elliot Wave Theory is a way of explaining mass psychology in financial markets and adding Fibonacci numbers way to organize it in structural wave principle. Ralph Nelson Elliott (1871–1948), a professional accountant, described that markets unfold in specific patterns - waves with certain sequence and occurence. This pattern is determined by rhythmical procedure of human behaviour (application of the theory can be found here). Using this way of thinking about markets move is contradictive and many opposite it, however there are signs that counting waves, rather than following market news in mass media, could improve your forecasting ability and thus your returns. As you should know markets are trading expectations and thus significant movements occur in the time before the event actually happens as current prices reflect future expectations. In this regard widely spread across traders is the saying: "Buy the rumours, sell the fact"! Back to the forecasting power of Fibonacci numbers and Elliot Waves Principle I have drafted Fibbo retracements and projection levels on the charts below. First and most important is to determine first major move in the beginning of new trend. It is not easy to define beginning of new trend as usually it could be set after wave 2 (correction of wave 1) has finnished. After that draw or calculate projections using Fibbo ratios. Important levels to consider are 61.8%, 161.8%, 261.8%. However the other ratios (23.60%, 33.30%, 38.20%, 41.40%, 50.00%, 76.40%) in determining moves are significant as well and should not be underestimated. 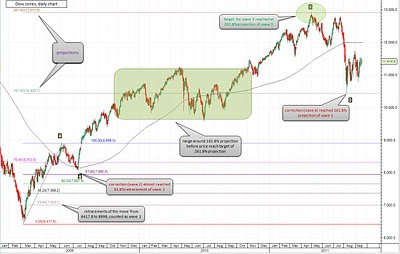 Actually bullish market started March 2009 was predictable using mentioned technique. Projecting first wave gives us second (correction of the first) which finished at 61.8% retracement. Usually third wave is biggest one from five wave Elliot pattern and should finnish around 261.8% projection of the first. In this case it matched exactly this level and dropped sharply to 161.8%. The relative accuracy of this method is amazing but is not coincidence. With knowledge of the relations and persistent observation markets appear to not be are so unpredictable. Most recent bull market experienced sharp correction fuelled by fears over double dip recession, rising debt and governments unable to meet their obligations. Looking trough the eyes of the described method I determine that this sharp drop has just finished fourth wave of the big trend started March 2009. 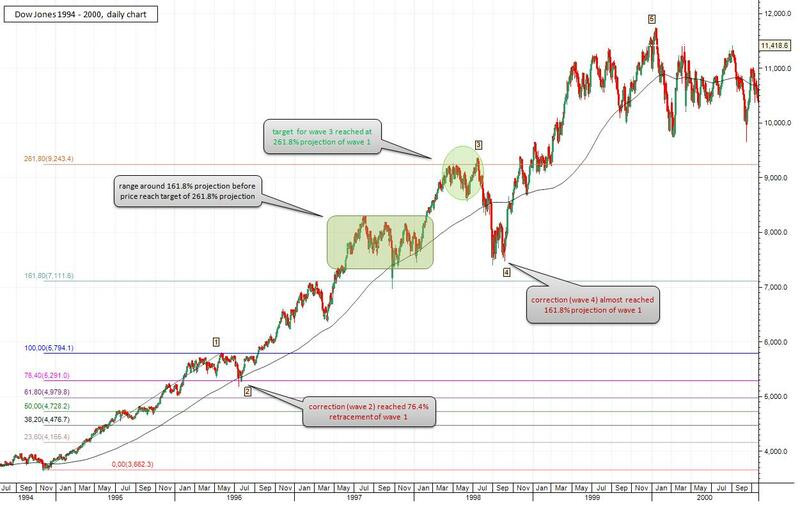 After formed wave 1 and subsequent correction (wave 2) we could project target level for wave 3. 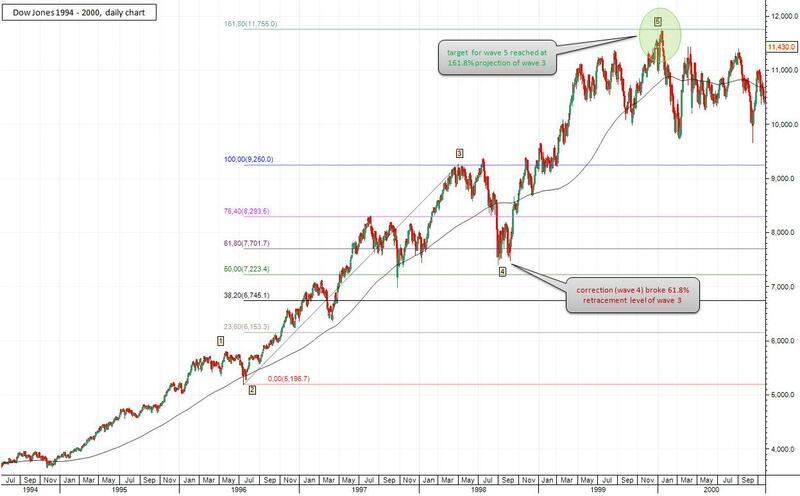 Using Dow Jones index setting 261.8% of wave 1 gives us target of 12 911 points for wave 3. 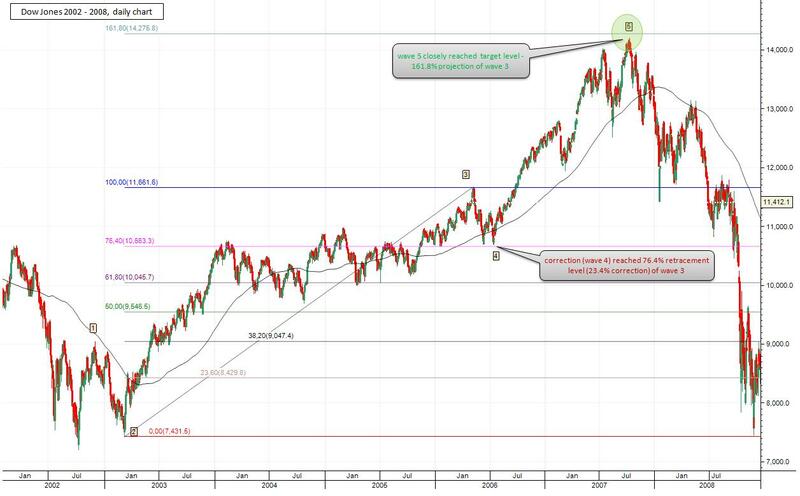 This level has been reached at end of April which was indicator for upcoming correction (wave 4). If still there are any doubts about predictive power of this method for forecasting you should inspect the analysis of last two bull markets - first started 1994 to 2000 and second from 2002 to 2008. Let's start with first one. Wave 1 is determined by the correction finished Jul 1996. This correction was 23.6% drop from wave 1 peak. 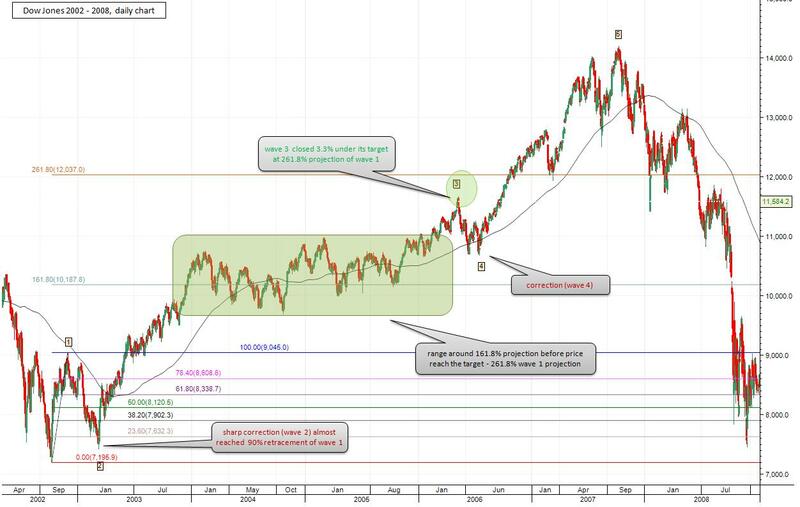 Given that 261.8% projection of the wave 1 for Dow is 9243.4 the market reached this target in March 1998 and after that followed sharp drop (wave 4). As seen on the chart this knowledge about wave correlations give us important sell level for exiting the market at 9243.4 and entering again after correction finished for capturing last bullish wave 5. The bull market started 2002 has different chart but the same structure - 3 impulsive waves and 2 corrective with correlation between. Here second wave is strong, correcting 90% of wave 1. This means that fourth wave should be small i.e. we should expect mild correction. Projecting 261.8% wave 1 gives us 11 995.8 points for Dow. January 2006 the blue chip index reached peak of 11 635.5 and reversed. The target was not exactly met. Dow closed 3.3% under wave 3 target, however the wave has been formed confirming relation between waves. Third wave end indicated start of a correction. Up to this moment we successfully determined third wave - the biggest positive move within bull market, its target setting and recognition of following correction (wave 4). Logical question which arise is how we define end of the entire impulse move (bull market)? This step is actually setting target for wave 5 and is as simple as previous action. Just apply Fibonacci projection ratios for the third wave. You will be amazed what accuracy this method sets the end of bull market. As noted before fifth wave is end of impulsive (bullish) move and mark the beginning of corrective one. 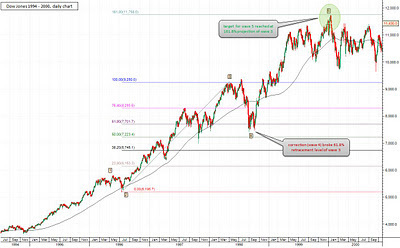 Within the 1994-2000 bull market 161.8% projection of the third wave started at Dow 5 187 and finished at 9 262 gives target for wave 5 at level 11 782. On Jan 14th 2000 market formed its peak - 11 748. As you see the deviation from the target is negligible small. After that point bear market started with Oct 2002 end. Same steps applied for latest bull market gives wave 5 projection for Dow at 14 290. Actual market cap appeared 14 193, just 1% lower. Target setting technique gave us pretty accurate forecast again. The first and most important is the determination of wave 1 and corrective wave 2. Then is the length of the first wave which is used to determine projections of 161.8 percent and 261.8 percent. Wave 3 is usually completed within the 261.8% projection of wave 1 and is the longest of the three impulse waves in the model of Elliott. Usually around the third wave level 161.8% prolonged period of consolidation is seen in all the three bullish market. Corrective wave 4 bottom usually falls not more than 161.8% projection of wave 1. If wave 2 has sharp decline (but not more than 100% of wave 1), then the drop of wave 4 will be small as in the case of the bull market from 2002 to 2008 and vice versa. Setting a target for wave 5 and the end of the bull market is by defining 161.8% projection of wave 3. You should note several important facts that must be considered when applying the above method of forecasting. Determine the phase of business cycle and what are the expectations for development of monetary and fiscal policies of the leading world economic centres. Isolated setting targets without taking into account the fundamental development of the market and surrounding environment is like looking into the crystal ball and is not based on any foundation. At the end stock markets are connected with real economy as the market calculates expectations for the economy and leads real economy trends by several months. Counting waves 1 and 2 is disputive and can be established with certainty only when a clear trend in the formation of the third wave has began. Targets proposed in this forecasting method are not always met as the case with wave 3 projection within bull market 2002-2008. The idea is to identify indicative areas for the goal. The method works with relative accuracy but review of the observed bull markets gave quite precise targets. To apply the method of forecasting one must have basic knowledge of the Elliot wave Principle and Fibonacci numbers.